-Flag are changed regularly every 3 months. -Ropes and clips are changed as needed at no additional cost. -Always fly a flag you can be proud of. -All flags are made in the United States of America. -Only one fee that beats the competition and also includes your flags. -Prices are for nylon. Polyester also available; call for pricing. 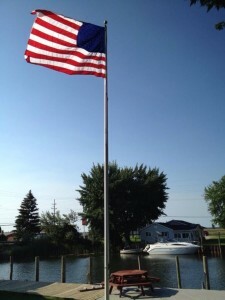 Revolution Flag Group’s Flag Maintenance program is offered in southeastern Michigan. We have built a trustworthy reputation with our Flag Maintenance program. We service many large corporations, small companies and individuals. The Flag Maintenance program gives the customer the ability to no longer have the worry about the appearance of their flag. Revolution Flag Group handles the installation of your flag by our trained crews and the maintenance of the flagpole throughout the year of the contract. Revolution Flag Group is fully insured and all flags are made in the United States of America. The prices on our website are for the United States and State of Michigan Flags. We also offer the flag maintenance program for custom, quality award flags etc.